A future University of Toledo student is a finalist competing in a nationwide video contest to win a $5,000 scholarship. Mahogany Fleming, a recent graduate from Wyoming High School in Cincinnati, submitted a video to the LIFE Foundation; the video tells the story of her deceased father and the way his death has helped to shape her life. When Fleming decided to attend UT, her mother, Tasha Fleming, began to look for scholarship opportunities to help pay for school. While searching for scholarships for her daughter, Tasha looked for assistance for children without parents. Her search brought her to the website of a nonprofit organization, Life and Health Insurance for Education, or LIFE. The organization was offering a scholarship opportunity for students whose parents had died with little or no life insurance. Mahogany submitted a video to the LIFE Foundation describing the life of her deceased father, Wade Fleming. Mahogany was only 9 months old when Wade was gunned down on the streets of Chicago. Wade and Tasha had been married for two years when the tragedy struck. They were both Chicago natives and had moved back to their hometown after attending the University of Louisville. Mahogany’s video described her life growing up in a home without a father and the challenges and struggles she and her mother went through emotionally and financially. Her work was one of three videos selected out of more than 1,000 entries. As a finalist, she was awarded $2,500. The LIFE Foundation asks the public to watch the three finalists’ videos and vote for the most deserving candidate. The student with the most votes will receive an additional $2,500 to help to pay for his or her education. Mahogany’s parents named her after the 1975 movie starring Diana Ross. “They both dreamed of having a daughter that would sing and touch the hearts of people,” Mahogany says in her video. Mahogany went to a performing arts school for three years and has participated in many musical productions. She also is the lead singer in a new band with a name that has yet to be determined. Mahogany’s video entry explains how both her mother and her deceased father have played a role in not only her musical success but also her strength and growth as a person. Mahogany’s video can be seen at www.lifehappens.org/vote. Votes must be cast on that website by 4 p.m. Tuesday, July 5. 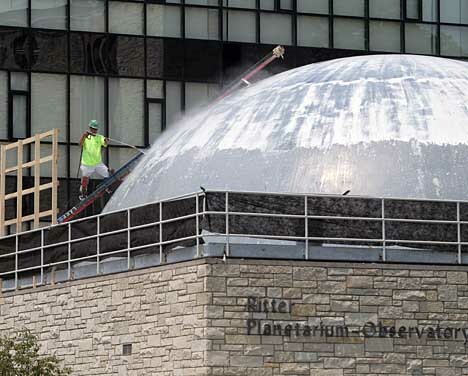 A worker from Lakeside Interior Contractors Inc., Perrysburg, power-washed the paint off Ritter Planetarium’s dome earlier this month. The structure has been repainted as part of the renovation. Ritter Planetarium will be the first planetarium in the world to house a new SciDome XD projector system, which will use two ultra-bright digital projectors that will transmit more than six million pixels onto the building’s 40-foot dome. The three-dimensional computerized space simulator is one of a number of upgrades under way at Ritter Planetarium, which has been the center for astronomical education in Toledo since it opened in 1967. The planetarium renovation also will include a 5.1 surround-sound system and new seating and carpeting to be installed this summer. The SciDome XD system, designed by Spitz Inc., is based on the SciDome system first introduced in 2002. It will replace the original Spitz A3P projector that Professor Emerita Helen Brooks and her husband, Elgin Brooks, designed the Ritter Planetarium around, as well as its current slide projectors, special effects projectors and sound system. Helen served as associate director of the planetarium from 1969 to 1972. When it opened in 1967, Ritter Planetarium was the state-of-the-art facility where UT students learned astronomy. When McMaster Hall was built next door 20 years later, the astronomy classes moved there; this opened the planetarium during the day and allowed Ritter’s K-12 programs to grow, nearly doubling the attendance. Today, the planetarium hosts between 200 and 300 programs each year and attracts visitors from a three-state area. It is not uncommon for school groups to visit from 50 or 60 miles away, Mak said. The renovation also will enable new multidisciplinary opportunities that will expand the use of the planetarium beyond astronomy to many other types of programs. From school groups to the general public, the planetarium serves 20,000 to 25,000 patrons on average each year, according to Mak. The planetarium also is extensively used by University students; during the Astronomy 1010 course, which is taken by almost 2,000 students per year, each spends about two hours in Ritter. Mak said it’s important the planetarium maintains the “unbelievable customer service” that makes Ritter a very personal, interactive facility and blend that service with updated technology. The project is estimated to be completed in early October, but a firm date has not been set for Ritter Planetarium’s grand re-opening, which will include several UT and community events, including a series for teachers and principals in area K-12 schools and a weekend-long event for the public. For renovation updates, go to www.utoledo.edu/as/rpbo/spitz_upgrade.html. Few remember the day in 1980 when hospital administrators called for 20 umbrellas to the ground floor of the Clement O. Miniger Radiation Oncology Center because of flooding, or know that Nobel Laureate Dr. Charles Huggins dubbed Toledo “the Cornish hen capital of the world.” Read about these stories and learn more in A Community of Scholars, Recollections of the Early Years of the Medical College of Ohio. The book was the idea of Dr. Mark Rayport, professor emeritus of neurological surgery and radiology and founding chair of the Department of Neurological Surgery at the Medical College of Ohio, and Dr. J. Thomas Martin, professor emeritus of anesthesiology and former chair of the Department of Anesthesiology. They took the idea to the Health Sciences faculty retirees group, MCO Faculty Seniors, which then undertook the task of making the concept a reality. The Faculty Seniors raised and contributed funds to finance the book, and with the additional support given by Lawrence J. Burns, vice president for external affairs and interim vice president for equity and diversity, Dr. Jeffrey P. Gold, chancellor, executive vice president for biosciences and health affairs, and dean of the College of Medicine and Life Sciences, and UT President Lloyd Jacobs, the story of the early years of the Medical College of Ohio came together in this 372-page volume. The goal of this undertaking was to cover the first 25 years of the Medical College of Ohio. The college was established in 1964 and the first class of medical students began in 1969. When the first class convened, MCO was the fourth medical school in Ohio and the 100th in the nation. A Community of Scholars begins with this first class, covering up to about 1995. The four editors, Dr. Shirley Ferguson Rayport, Dr. E. Dorinda Shelley, Dr. Peter White and James R. Winkler, part of the MCO Faculty Seniors, recruited the nearly 70 authors who contributed personal recollections and accounts in an attempt to recreate the spirit of those early years. It includes chapters for each academic department in the school of medicine, a chapter for the school of nursing, a chapter written by former students and a chapter about the administration. It also features hundreds of photographs of students, nurses, faculty and physicians. “Not just another dusty history book, this is a chronicle of the development of a new medical school with lessons that apply to anyone who is developing new education programs, particularly in medicine,” White said. A Community of Scholars offers a glimpse into the humanity of physicians and professors of medicine, a side that often goes unseen. It tells the story of Toledo’s fight against competing medical schools in Ohio, the rally of a community with a vision, and the “political spadework” that had to be done for this vision to become the respected institution that it is today. It is a book about history, a book about humanity, and a book about the courage and tenacity of a community united. 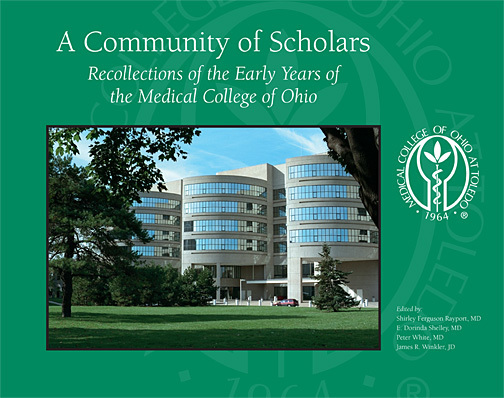 A Community of Scholars: Recollections of the Early Years of the Medical College of Ohio is available for purchase for $30 through The University of Toledo Press at www.utoledopress.com. 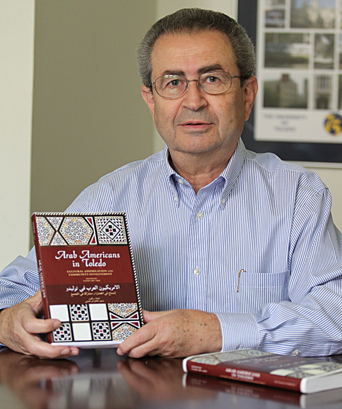 Arab Americans in Toledo: Cultural Assimilation and Community Involvement, a book edited by a UT professor emeritus and published by The University of Toledo Press, is the winner of the 2011 Evelyn Shakir Nonfiction Award. The book, which was published last year, includes a collection of essays, interviews and profiles that focus on the population of Arab Americans in the Toledo area. The nonfiction award is named in honor of Shakir, an Arab-American writer and professor who died in 2010. The Arab American National Museum, which presents the award, is located in Dearborn, Mich., a city with the largest Arab-American population in the United States. The museum is the first in the world focusing solely on Arab-American history and culture. “It’s wonderful the national Arab community has picked this up and appreciated it as much as they have,” said Dr. Tom Barden, dean of the Honors College and general editor at The University of Toledo Press. Abu-Absi said he was inspired by two books published by the Urban Affairs Center Press, later The University of Toledo Press, about ethnic populations in Toledo. Arab Americans in Toledo joined Hungarian American Toledo and The Irish in Toledo in the series. Abu-Absi was born and raised in Lebanon and did graduate work at Indiana University before being hired as a member of the English Department faculty at UT in 1968. He began working on the book around the time he retired from the University in 2006. It took about four years to gather the materials that made it into the book. The Evelyn Shakir Nonfiction Award is an honor not only for Abu-Absi, but also the University and The University of Toledo Press. Abu-Absi will receive the award at the Arab American Book Award Ceremony Sept. 29 at the Carnegie Institution in Washington, D.C. Although the Cirque du Soleil cast spoke Russian, Polish and other unfamiliar languages, Mark Kosmyna recognized the relief in their voices when he appeared with his repair equipment. His presence, after all, meant the Cirque du Soleil “Alegria” show in the downtown Toledo Huntington Center could go on last month. Kosmyna, a biomedical engineering equipment technician for The University of Toledo Medical Center, donated his time and service May 20 to repair an ultrasound therapy machine the pliant performers rely on to soothe their strained muscles. The traveling Cirque du Soleil troupe is renowned for athletic feats achieved by its performers who come from all over the world to perform with the group, which was in Toledo May 18-22. David Burton, the supervisor for performance medicine for the Cirque du Soleil “Alegria” show, suspected the therapy machine wasn’t functioning properly and called the UTMC Biomedical Engineering Department for help recalibrating its operational parameters. Joseph Munier, another technician at UTMC, arranged the logistics for Kosmyna and the equipment necessary to conduct the recalibration at the Huntington Center. Kosmyna said it took about an hour to perform the operational check and recalibrate the therapeutic device. 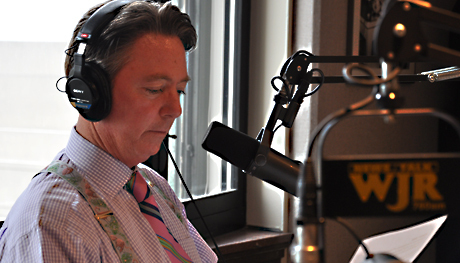 Burns spoke with Steve Courtney, who was filling in for Smith, about the new radio show that succeeds the successful “Environmentally Sound” and broadens the conversation beyond sustainability to all the ways higher education impacts our world. “We felt that universities are becoming such an important element of our communities, be it economic development or first-generation students, that we needed to broaden the topic base. So that’s what we’re doing with ‘The Relevant University.’ We are going to cover everything from athletics to economic development to new courses at universities around the country and around the world,” Burns said in the interview, which aired at 6:50 a.m. The first episode of “The Relevant University” will air at 7 p.m. Tuesday, June 28, with a panel of university presidents as the first guests: UT President Lloyd Jacobs, East Carolina University Chancellor Steve Ballard, Virginia Commonwealth University President Michael Rao and University of Notre Dame President the Rev. John Jenkins. The University of Toledo Information Technology Department is updating the password reset questions associated with UTAD accounts to make it more difficult for someone to research the answers and gain access to accounts. Security questions to reset passwords are a common IT industry standard control, but the increased sharing of information through social networks can make it easier for someone to research the answers and gain access to individual accounts. Your mother’s maiden name, for example, is easy to find out if she is your friend on Facebook, and a large number of people will answer Toledo for the city they were born, said Mike Lowry, assistant manager for information security. To help make those password security questions more secure, the University’s IT Department has eliminated options for which the answer could be found elsewhere and added new questions. UTAD account holders who previously had a security question that has been eliminated will be taken to a screen to choose a new question when they log in. IT also has added a warning that reads, “Please choose a question that is not answerable with researchable information (i.e. Facebook, etc. )” to further raise awareness. Account holders can visit https://myUTaccount.utoledo.edu and log in using their UTAD username and password to see if they need to set a new password reset question. 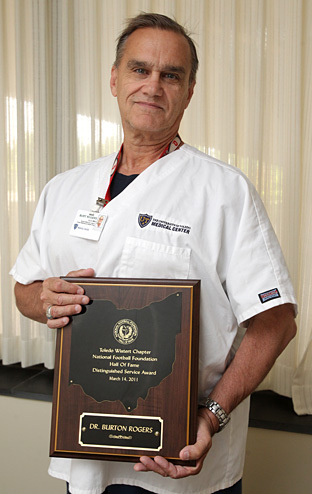 The Toledo Chapter of the National Football Foundation and College Hall of Fame recognized Dr. Burton Rogers, the sports medicine liaison to The University of Toledo, with its 2011 Distinguished Citizen Award. The award is presented to individuals who demonstrate a vested interest in the game of football through leadership, scholarship and citizenship. The award is part of how the foundation supports its mission of “building leaders through football” by recognizing athletes, coaches and individuals who have influenced the game. “Such an elite group of individuals makes the decision as to whom receives the award, and to be selected out of a well-known group is extremely special to me,” Rogers said. Rogers is a UT alumnus who received his master’s degree in school and public health and his doctorate in biomechanics and anatomy. As an undergraduate, Rogers attended Ashland University, where he played football from 1968 to 1971. He went on to serve as an assistant and head football coach at Bowsher High School from 1975 to 1980. He has been the liaison to sports medicine at UT for three years. Rogers said he enjoys working with athletes who are recovering from an injury to help get them back on the field to play hard and successfully. The Distinguished Citizen Award was presented at a March ceremony in Stranahan Theater with about 700 guests in attendance. The speaker for the event was former Ohio State Football Coach Jim Tressel. The event also showcased 35 football scholar-athletes for their excellence in the classroom and graduating with 3.75 GPAs. And Rockets Quarterback Alex Pettee was recognized with a graduate school award. The UT Department of Medical Microbiology and Immunology is honoring Dr. Earl Freimer, the first chairman of the department, with an award and scholarship in his name. The award to be renamed in honor of Freimer has been given for years to a graduating medical student who showed the most exemplary performance in the infection and immunity block of the curriculum. The department also will establish a scholarship fund for MD and PhD students whose research is carried out in the infection, immunity and transplantation track within the department. Freimer, who died May 23 at age 84, was a physician, instructor and researcher during his career at the former Medical College of Ohio who co-authored 40 scientific publications between 1959 and 1997. “Dr. Freimer combined the practice of medicine with clinically relevant research in his own career, so it seems very appropriate to have a scholarship in his name that would support students working toward both an MD and a PhD in infection, immunity and transplantation,” said Dr. Akira Takashima, professor and chair of the Department of Microbiology and Immunology. Freimer was recruited as the chairman of the then Department of Microbiology at MCO when it was founded in 1968. He also was the founding chief of the Division of Infectious Diseases. After serving a medical internship at Belleview Hospital in New York, Freimer began his career in research at the Rockefeller Institute with Maclyn McCarty, a well-known American geneticist, studying diseases caused by the bacteria Streptococcus. Freimer worked at the Rockefeller Institute until 1967, during which time he co-authored a paper with McCarty on rheumatic fever, a disease caused by Streptococcus. Freimer’s impact on the department after 30 years continues to be significant. “The department and the college have evolved since he was chair, but his impact was profound on everything from the curriculum through faculty hiring to the design of the Health Education Building,” said Dr. Robert Blumenthal, professor and director of the Program in Bioinformatics and Proteomics/Genomics. Those interested in donating to the new Freimer scholarship fund should contact Howard Newman, associate vice president of development on Health Science Campus, at 419.383.6840 or email howard.newman@utoledo.edu.